Comments: Breeding birds are large with a heavy, tapered yellow bill, white throat and cheeks, dark crown and a reddish foreneck. In winter, their throat becomes dusky and the white from the chin extends to the back of the face in a crescent. They are distinguishable from Western and Clark’s grebes by their dark eyes, smaller size, shorter necks and stockier appearance. 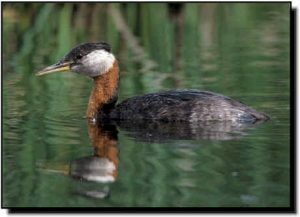 Red-necked Grebes breed in the extreme northern Great Plains and winter primarily on deep, open water along the Atlantic and Pacific coasts. They also winter in limited numbers on the Great Lakes.